Is the Space Station a Money Pit? 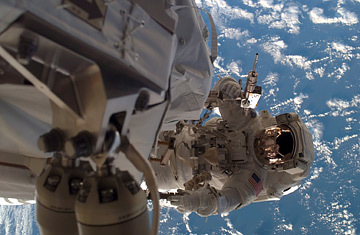 Mission specialist John "Danny" Olivas, carries out construction on the International Space Station. There are bad ideas, and then there are true historic stinkers. Put the International Space Station in that second category. Today, the most underachieving machine NASA ever dreamed up got into trouble again, when computers that control the station's oxygen, water supply and orientation failed. With the three-man station crew just joined by the seven visiting astronauts of the space shuttle Atlantis, the specter of Apollo 13 on a grand scale  with 10 astronauts in danger this time instead of merely three  immediately arose. The good news is, the shuttle and station astronauts are in nowhere near the danger the 1970 lunar crew was; in fact, they're not in much danger at all. The bad news is, the station has once again proven itself unworthy of all of the time, money and attention that has been lavished on it over the last two decades. It's no surprise that there are a lot of things that can go wrong with a machine like the space station  and no shame when some of them do. The orbiting complex is 240 ft. long at its maximum, weighs 471,444 lbs. and encloses 15,000 ft. of habitable space. It is being built and maintained principally by NASA, the European Space Agency and the space agencies of Russia, Japan and Canada, an arrangement that spreads the costs and the burdens but also diffuses the responsibility. If your SUV occasionally needs a trip to the shop, imagine what it takes to keep a complicated leviathan like this going. The latest breakdown occurred in computers built and supplied by Russia. The idea that the problem affects the air and water systems sounds scary, but the fact is the station carries at least a 56-day reserve supply of oxygen, and while it doesn't keep as much water on board, there's more than enough to keep anyone from going thirsty for a good while. "We have plenty of resources so we have plenty of time to sort this out," said NASA's Mike Suffredini, a manager of the space station program. A bigger potential problem is the loss of precise control over station orientation. Part of the reason for Atlantis's current visit is to install a new pair of solar arrays, just two of several such reflective wings that help supply the station with power. But collecting solar energy means being able to keep yourself pointed toward the sun, not so easy if you're drifting off center. The computers also help orient the station to avoid space debris and move into position for docking with the shuttle or arriving cargo ships. For now, the shuttle's thrusters and the station's own gyroscopes will keep things reasonably stable, but that is not a permanent fix. In the unlikely event things grow even worse aloft, all 10 crew members would be able to bail out easily. The shuttle can leave at pretty much any time, and a Russian return vehicle is always kept attached to the station  not as roomy or comfortable as the shuttle perhaps, but plenty good for jumping overboard and making a quick plunge back to Earth. The larger question, as always, is why we're bothering with this whole program in the first place. The station was originally proposed 23 years ago as an $8 billion orbiting laboratory that would perform cutting-edge biological research, manufacture new and highly marketable materials impossible to make in the gravity environment of Earth and generally pay for itself many times over. Close to two decades past deadline and now carrying a projected $100 billion price tag, it has not returned a lick of good science  nor is it likely to. Meantime, it's diverting billions from NASA's budget that could better be spent on the agency's brilliantly successful unmanned space program, as well as its promising efforts to return astronauts to the moon and eventually explore Mars. These days, as critics rightly point out, the space shuttles exist principally to build and service the station, and the station exists merely to give the shuttles a place to go. The shuttles, meantime, which have already claimed the lives of 14 astronauts, continue to accumulate wear as they limp toward the 2010 deadline when the station is set to be completed and they'll be allowed to retire. In the next several days, Atlantis astronauts will undertake a risky spacewalk to repair a thermal blanket that pulled up from a small section of one of the shuttle's engines  possibly exposing it to damage during reentry. Their first-line tools for this important work? Staples scrounged from the shuttle's medical kit. If ever a pair of government programs cried out to be mothballed, it's these.